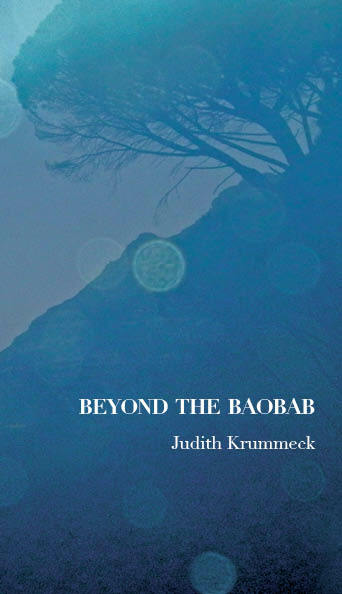 Beyond the Baobab, by Judith Krummeck, is simply elegant. From the first sentence of the first essay, to the very last line of the book, Krummeck uses subtle humor and rich allusions to invite readers into her head, into her heritage, into her hesitancy about becoming an American. Her story is not only one of emigration from South Africa to the United States. The essays chronicle her change, growth, unexpected adventures, and her search for a sense of identity and belonging. The collection’s first piece, That July Day, takes readers along for a walk in Old Town, Alexandria, Virginia, as Krummeck recalls her first afternoon as an American immigrant. She wanders through the streets, observing the many ways this new country is different from what she had expected and dreamed. Krummeck’s first encounters are jostling, but she portrays her bumpy ride both vividly and humorously. “As people came towards me on the sidewalk, I wanted to step left instead of right,” Krummeck writes, recalling the dangers of switching her street orientation. The scene above may be about driving on the wrong side of the road, but its story asks, do I belong here? Could this be home? Cape of Good Hope, No. 8 Chapman Street, and On Loader Street take us through chapters of Krummeck’s life, capturing the innocence of her childhood through her adolescence and young adulthood. Krummeck’s vivid memory stops time, fully exposing these other versions of her character. Readers are invited to explore significant moments in Krummeck’s life as well as her first relationships in an intimate yet fleeting fashion. In The Arduous Undertaking, readers are introduced to Sarah and George Barker, two of Krummeck’s ancestors who left England in 1815 to become missionaries in South Africa. Krummeck explores their lives through the pages of George’s journal, questioning the connection between their proclivities to migrate and her own. Only Krummeck could make these long-time dead missionaries come to life in a way that makes the reader care about them and their continuous impact on her life. In Stamp of Approval readers will hold their breath as immigration authorities inspect Krummeck’s visa and passport, causing her to worry that she won’t be allowed to stay in the US. Similarly, the honesty of the narrator’s grief in, Getting the News, is heavy on the page. Readers can taste Krummeck’s fundamental angst, and a realm of other complicated emotions influencing her voice. Nevertheless, she tells her story in a simple and honest manner, making her personal stories echo in her reader’s imaginations. Ever conscious of her absence in her homeland, the author’s nostalgia for old friends, family, routines and a lifestyle that she vividly remembers, creates the impression that her soul has split, and there are in fact two “Judiths” carrying on separately. This collection meets at the crossroads of these two lives, piecing together a full picture of the memoirist. From its masterful use of language, to the physical beauty of the lines on the page, Beyond the Baobab is a delightful tour of Africa and the United States. Krummeck vividly recalls scenes from her childhood set on the iconic coast of Southern Africa, the unease of early adulthood, and the final leap of faith surrounding her decision to emigrate. In every essay, Krummeck skillfully navigates between her poignant feelings of peace and unrest, delivering a detailed perspective of her life’s choices, while meditating on the lingering questions that still surround her immigrant identity. Where does she belong? Is choosing a life enough to make it hers? What’s beyond the Baobab?